Adoption of Microsoft's newest Windows operating system remains relatively low but it seems it's finally picking up. 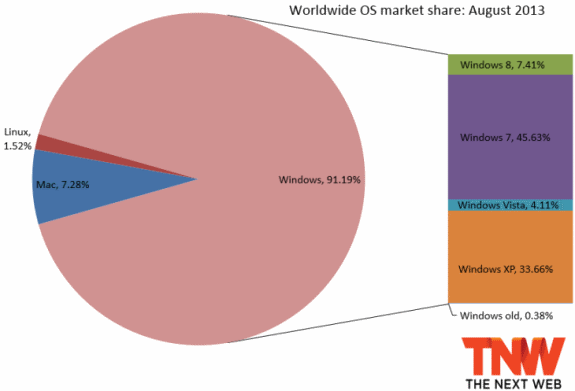 Net Application's worldwide OS marketshare data reveals that Windows 8 had a marketshare of 7.41 percent in August 2013, up from 5.40 percent in July. Windows 7's marketshare rose from 44.49 percent to 45.63 percent, while Windows XP's marketshare fell from 37.19 percent to 33.66 percent. We attributed June’s big jump to Microsoft releasing its free preview of Windows 8.1, the next version of Microsoft’s operating system, which will be a free update for Windows 8 users available via the Window Store. August’s huge jump of over two percentage points, however, is very difficult to explain. Possible factors include the price cut of both the Surface RT and Surface Pro, the RTM of Windows 8.1 and subsequent leaks, as well as corporations speeding up their upgrade paths away from Windows XP. Yet even all these factors don’t seem to be enough and we wouldn’t be surprised if August’s gain was just a blip in the data.